al-4, Array Speaker Cabinet from VUE Audiotechnik in the al-Class series. 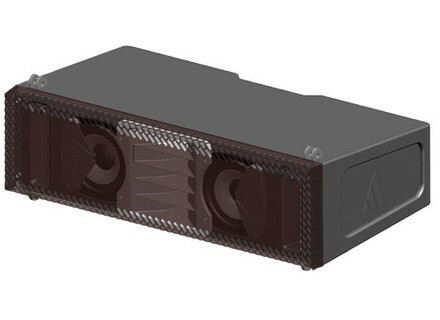 Vue Audiotechnik will introduce at NAMM 2013 the new al-4 subcompact line array system, which includes speakers and a power amp. The al-4 Line Array System is made up of the al-4 Acoustic Element, and the rack mount V4 Systems Engine, which provides amplification, DSP and system control for up to 8 elements. The system is sold in standard blocks, with eight al-4 Acoustic Elements and a single V4 Systems Engine comprising a single block. Multiple al-4 blocks can be combined to address larger applications. NL4 Input and Loop connections on rear for easy daisy-chaining of line array elements. Visit www.vueaudio.com for more information. APG DX5 Monitor Speaker DX5 is the latest addition to the Dispersion Series of multipurpose monitor speakers from French manufacturer APG. 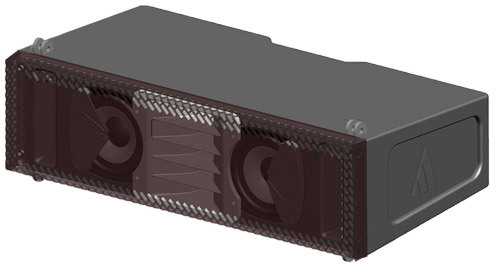 Electro-Voice ZX1-Sub Electro-Voice has added to its family of ZX loudspeakers with the introduction of the passive 12” ZX1-Sub.